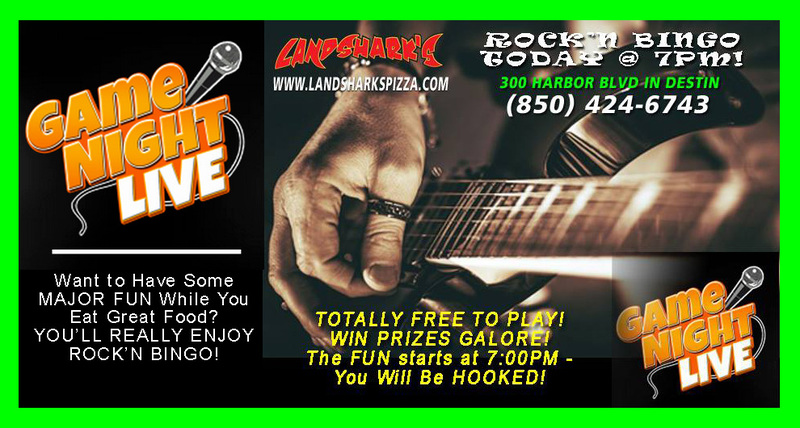 / Best Taco in Destin FL / Taco Tuesday in Destin HAWKS vs CAVALIERS, NCAA B-BALL BONANZA & Landshark’s ROCK’N BINGO@7PM! 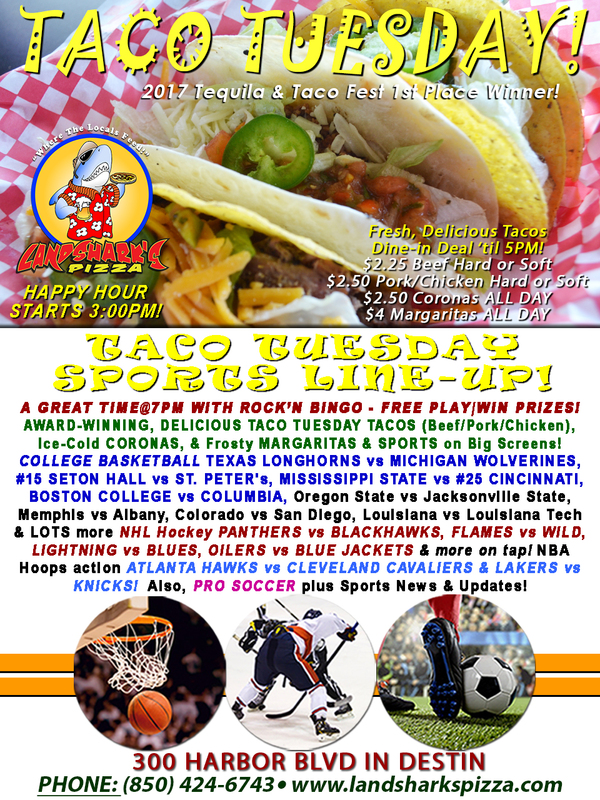 Taco Tuesday in Destin HAWKS vs CAVALIERS, NCAA B-BALL BONANZA & Landshark’s ROCK’N BINGO@7PM! 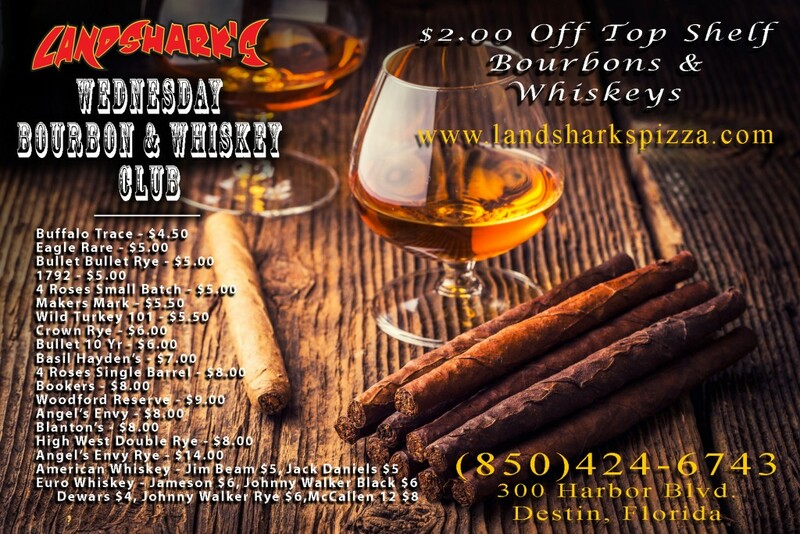 The 2nd day of the work week is festive & fun TACO TUESDAY here at Landshark’s Pizza featuring ROCK’N BINGO & TACO TUESDAY SPECIALS along with NCAA Basketball, NHL, NBA & other sports action here at Landshark’s, your sports fest Taco Tuesday headquarters with Taco & Drink specials! 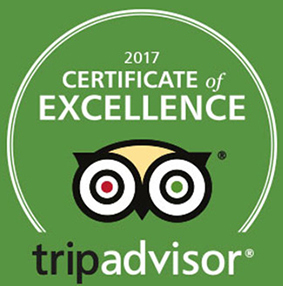 Our AWARD-WINNER TACOS Tuesday Specials: $2.25 BEEF, $2.50 PORK OR CHICKEN (dine-in ’til 5pm with regular drink purchase). Also featuring $2.50 Coronas & $4 House Margaritas go all day long! WE ALL WANNA ROCK@7:00PM playing ROCK’N BINGO TONIGHT! 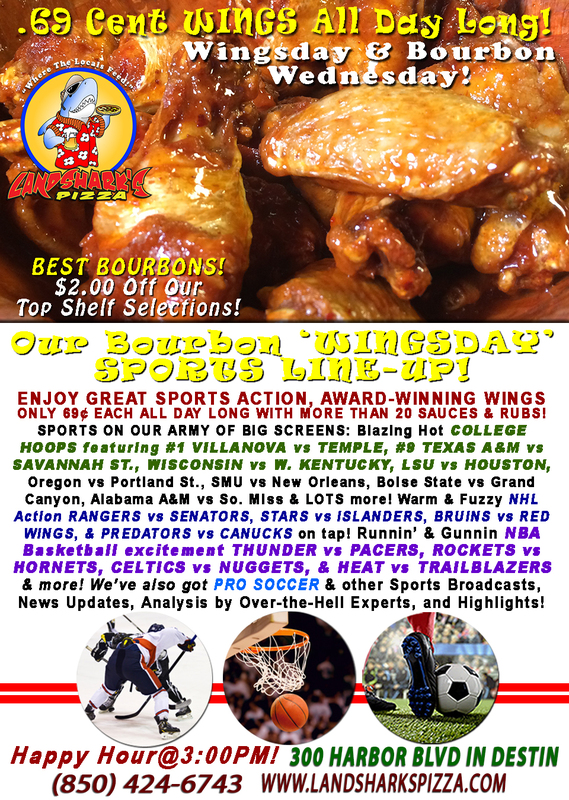 HOT SPORTS ON OUR ARMY OF BIG SCREENS – COLLEGE BASKETBALL TEXAS LONGHORNS vs MICHIGAN WOLVERINES, #15 SETON HALL vs ST. PETER’s, MISSISSIPPI STATE vs #25 CINCINNATI, BOSTON COLLEGE vs COLUMBIA, Oregon St. vs Jacksonville St., Memphis vs Albany, Colorado vs San Diego, Louisiana vs Louisiana Tech & LOTS more! NHL action-packed PANTHERS vs BLACKHAWKS, FLAMES vs WILD, LIGHTNING vs BLUES, OILERS vs BLUE JACKETS & more on tap! NBA Hoops excitement ATLANTA HAWKS vs CLEVELAND CAVALIERS & LAKERS vs KNICKS! Plus PRO SOCCER coverage and plenty other Sports Broadcasts, Updates, Analysis, and Commentary! 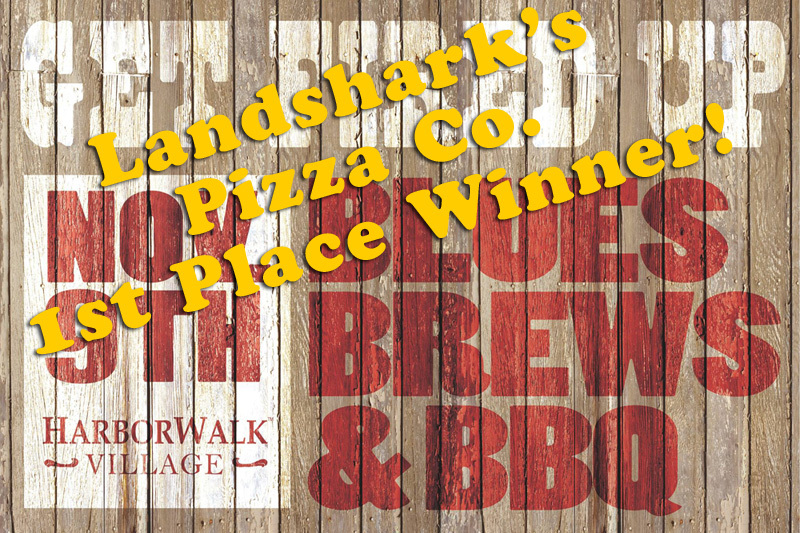 CALL LANDSHARK’S PIZZA CO. FOR YOUR EVENT CATERING! 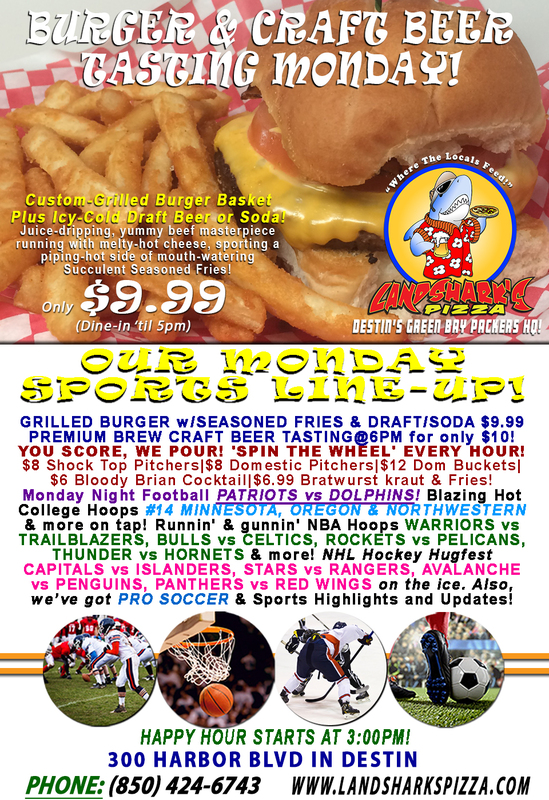 Previous Post: « Sunny Burger & Brew Monday PATRIOTS vs DOLPHINS & You Score, We Pour|College Hoops, NHL & CRAFT BEER TASTING!